"Heart block" is a a condition in which the heart's electrical signal is slowed down or stopped entirely as it moves from the upper cardiac chambers (the atria) to the lower cardiac chambers (the ventricles). Heart block—also called atrioventricular block, or AV block—is one of the two major causes of bradycardia (slow heart rate). (The other major cause is sinus bradycardia). Read about the heart's electrical signal. In heart block, the heart's electrical impulses are partially or completely blocked as they attempt to travel from the atrial chambers of the heart to the ventricular chambers. Because these electrical impulses let the heart know when it is supposed to beat, if heart block is severe enough it may slow the heart rate to dangerously low levels. If you have heart block, a main question your doctor will need to answer is whether you will need a pacemaker to prevent serious injury or death from an extremely slow heart rate. To answer this question, your doctor will need to determine what is causing your heart block, and whether the heart block is transient or whether it is likely to persist or become even worse. In making this evaluation, your doctor will take into account the cause of your heart block, the symptoms you are experiencing from it, the degree of heart block (more on this below), and the specific location within your heart that is causing the block. Brief episodes of heart block are not always dangerous or even abnormal. Transient heart block is often seen in young, healthy people who experience a sudden increase in the tone of their vagus nerves. This increased vagal tone often happens with nausea, vomiting, or in response to pain, fright, or sudden stress. This form of heart block is not life-threatening and does not indicate any underlying problem with the heart's electrical system. It disappears immediately once the triggering event has subsided and almost never requires insertion of a pacemaker. On the other hand, heart block can also occur with various cardiac diseases, especially coronary artery disease, heart failure, or myocarditis. There are also congenital forms of heart block. In general, when heart block is produced by heart disease, there is likely to be a permanent disorder of the cardiac electrical system. This kind of heart block often gets worse over time, so pacemakers are often required. Depending on its severity, heart block may produce a range of symptoms, from none at all to dizziness, syncope (loss of consciousness), or even death. If heart block is producing symptoms—especially dizziness or syncope—then treating it with a pacemaker is usually required. The exception to this general rule is when the heart block is known to be transient—for instance, when it is due to a temporary increase in vagal tone. Heart block that is not producing any symptoms whatsoever usually does not require a pacemaker, unless it is one of the kinds of heart block that is very likely to get worse over time. Heart block is categorized by doctors into one of three "degrees." Your doctor can determine the degree of your heart block with an electrocardiogram (ECG). The higher the degree of block, the more dangerous the heart block is likely to be. First degree block means that each cardiac impulse eventually makes it from the atria to the ventricles, but conduction of the impulse is slowed. Second degree block means that some of the impulses are successfully conducted to the ventricles, but some are not. Third degree block means that all of the electrical impulses are blocked, and none of them are reaching the ventricles. Third degree heart block is also referred to as "complete heart block." In a person with third degree heart block, survival depends on the existence of extra pacemaker cells located below the site of the block. These subsidiary pacemaker cells generate their own electrical impulses, usually at a very slow rate, which at least allow the heart to keep on beating. The heart rhythm produced by these subsidiary pacemaker cells is called an "escape rhythm." An escape rhythm, while life-saving, is often unreliable for prolonged periods of time. In general, the higher the degree of heart block, the more likely the need for a pacemaker. 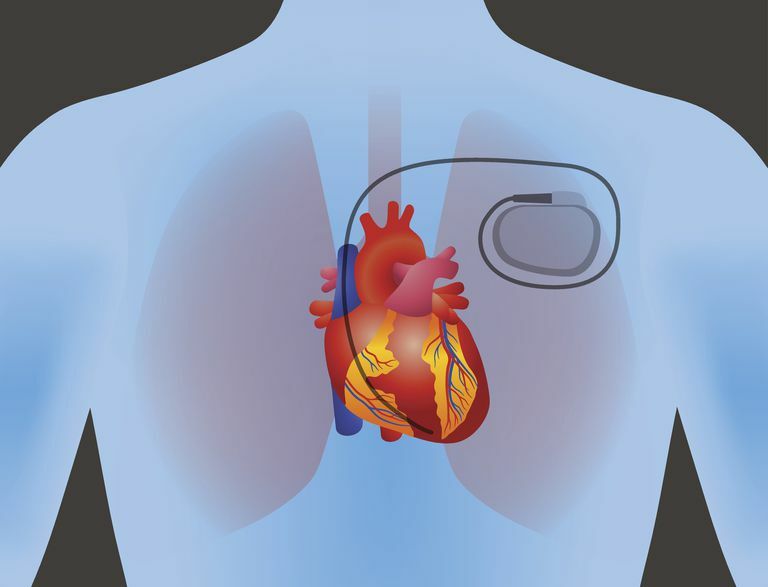 Pacemakers are almost always required with third degree block, often with second degree block, but only rarely with first degree block. In determining the severity of heart block, it is important to know where in the AV junction the block is occurring. Specifically, is the block within the AV node, or is it in the His bundle (or the bundle branches which arise from the His bundle)? In most cases, the doctor can determine the location of the heart block simply by examining the ECG. Sometimes, however, an electrophysiology study is needed to precisely localize the area of block. Heart block that occurs within the AV node (so-called "proximal" heart block) is usually pretty benign, and often does not require a permanent pacemaker. When the block is occurring within the AV node, subsidiary pacemaker cells in the AV node just beyond the site of the block often take over the rhythm of the heart. This is called a "junctional escape rhythm." A junctional escape rhythm tends to be relatively stable, and does not pose a threat to life. On the other hand, with "distal" heart block, the block occurs in or below the His bundle. Any subsidiary pacemaker cells in a person with distal heart block can only be located in the bundle branches or the ventricles. The resulting heart rhythm is called a “ventricular escape rhythm.” Ventricular escape rhythms are not only extremely slow, but they also are also notoriously unreliable. The presence of a ventricular escape rhythm is usually considered a medical emergency. Distal heart block tends to worsen over time. So even in cases where it is currently causing only first or second degree block, distal heart block is considered dangerous, and virtually always requires treatment with a pacemaker. If you have been told you have heart block or AV block, you and your doctor will need to take several factors into account in order to determine whether you need a pacemaker. Fortunately, gathering the necessary information is usually a relatively quick and straightforward process, and determining the correct course of action can usually be accomplished very quickly. Kusumoto FM, Schoenfeld MH, Barrett C, et al. 2018 ACC/AHA/HRS Guideline on the Evaluation and Management of Patients With Bradycardia and Cardiac Conduction Delay: A Report of the American College of Cardiology/American Heart Association Task Force on Clinical Practice Guidelines and the Heart Rhythm Society. J Am Coll Cardiol 2018.